Colored foliage is always a boost in the garden, bringing color all season, not just for a few weeks. The Newport Purple-leaf Plum not only has fabulous purple leaves that hold their color from spring to fall, it has a beautiful display of fragrant pink flowers that cover the bare branches in late winter or early spring. As if that was not enough, this tree grows up to three feet in a year when young, so it will be a presence in your garden in just a few seasons. It makes a beautiful hedge or screen too and it can be trimmed easily to fit your needs. The perfect medium size for today’s smaller gardens, the Newport Purple-leaf Plum will give you flowers, foliage and fruit from just one tree. It is also happy even in extremely acid or alkaline soils and even clay. 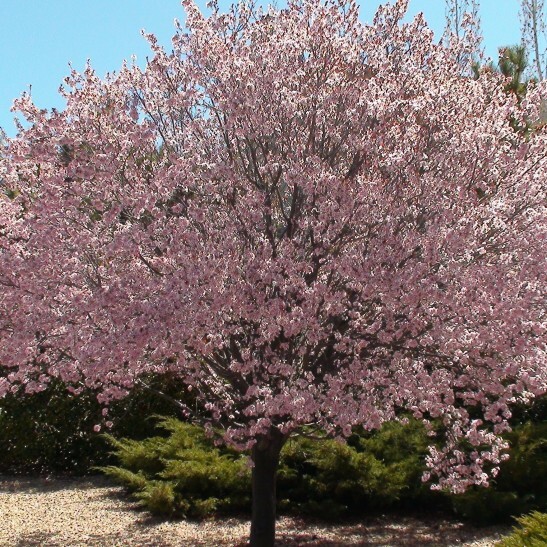 The Newport Flowering Plum Tree is a popular ornamental tree, perfect for providing some light shade in smaller yards. This deciduous spring flowerer also looks brilliant when planted in rows, offering a stunning border along driveways, entryways, or streets. 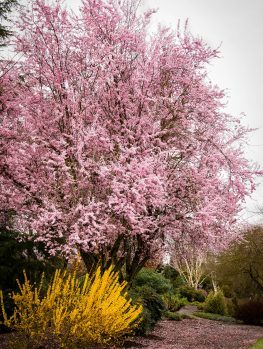 The Newport Flowering Plum Tree begins the seasonal show it puts on annually with early springtime blooms – pink and white blossoms, about an inch in diameter, burst forth before the coming leaves, alerting the eye to the coming warmth. The flowers are replaced by purple leaves in summer, which deepen to a rich crimson in time for autumn. The twisted brown branches evoke a mysterious quality in winter, twirling in the white snow to provide four season beauty. The Newport Flowering Plum is also a perfect shade tree. After reaching to between 25 and 30 feet tall, the 20 to 25 foot spread of this Plum Tree offers a peaceful shade, sparing its sequestered people and undergrowth from the harshest summer rays. Many flowering ornamental trees are limited in range, due to either poor weather variability tolerance, specific soil or watering requirements, or other needs that limit the ornamental from performing in a variety of locations. This is not the case for Newport Flowering Plum Trees, which grow throughout most of the United States. 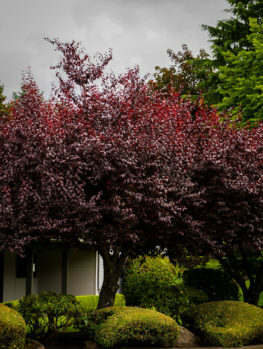 The Newport Flowering Plum Tree has a fast, dependable growth rate. It gains between 3 and 5 feet of new growth a year – or sometimes even more! 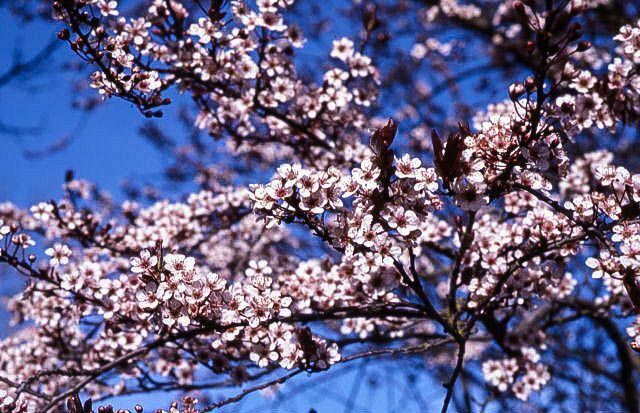 In order to get the fastest growth, water the Newport Flowering Plum Tree at least once a week and fertilize once in spring and once in late summer. The Newport Flowering Plum Tree is an immensely popular ornamental shade tree that is planted throughout much of the United States. It is widely planted for a wide variety of reasons. It is a reliable tree, and when provided proper care, it will delight each season and live a healthy life. Paired with this is the tree’s fast growth rate, which quickly raises the tree up to its full height in just a few seasons. The stunning seasonal interest of the Newport Flowering Plum Tree also makes it a popular plant. Springtime brings beautiful white to pink blossoms, which fall to reveal majestic purple leaves in summer. Over the hot summer days, the leaves slowly darken to a rich crimson, sprinkling the otherwise yellow-brown autumn foliage with vibrant burgundy. The Newport Flowering Plum cannot fail to make a visual impression on its planters! 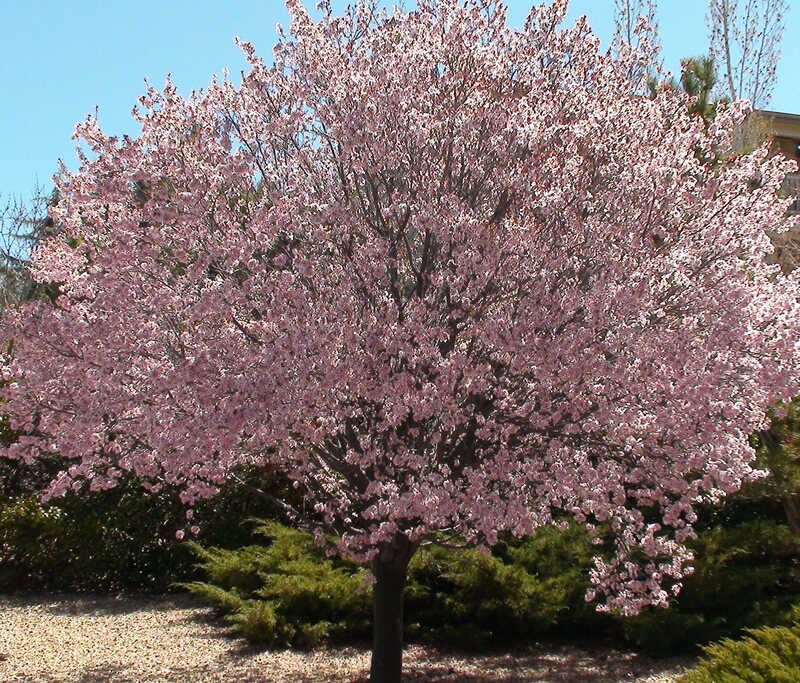 The Newport Flowering Plum Tree is an easy-to-care-for tree. Pruning and daily maintenance are not needed, making this an ideal tree for a first time planter. Its small size makes it perfect for smaller nooks and patio areas. It works well for those with limited space. 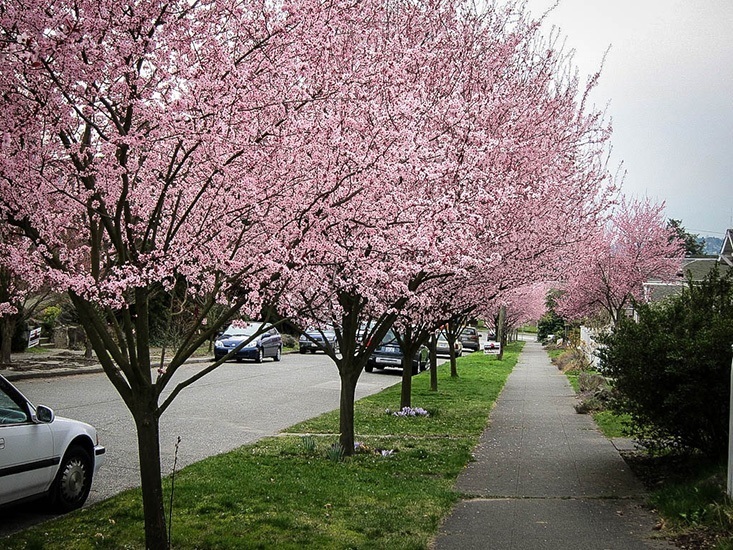 When fully mature, the Newport Flowering Plum Tree usually reaches between 25 and 30 feet tall and between 20 and 25 feet wide. These Plum Trees are famously adaptable, so any location in full sun or partial shade should be fine. Once you’ve decided where to plant the tree, you need to dig a hole! The hole should be twice as wide as the Newport Flowering Plum Tree, and only just as deep. 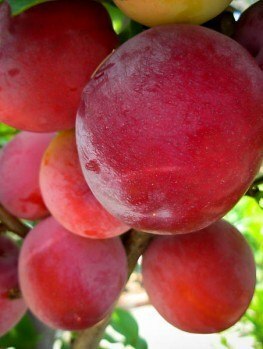 In fact, if the root ball of the Plum Tree protrudes from the soil about 1 inch, all the better. The tree will settle over time. Once the tree is in the hole, hold it vertically and backfill with soil and water. Use mulch around the base of the tree and water immediately. 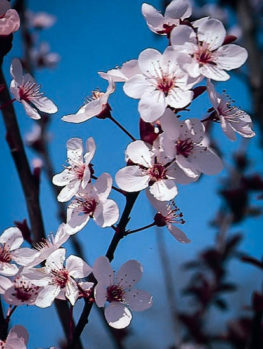 The Newport Flowering Plum Tree is rated hardy in USDA Hardiness Zones 4-10, making it one of the few trees to grow successfully in all 48 contiguous United States. Like most trees, the Newport Flowering Plum Tree prefers moist, well-drained, slightly acidic soil. However, this tree is also adaptable to clay, silty, or sandy soils. This hardy Flowering Plum Tree manages drought and harsh climates with ease. Some gardeners have reported infestations of wood borers. These insects will drill into the plant system, severing the transport systems. This causes the leaves and roots to dry up. Controlling these borers is manageable though. If diseased branches are discovered, remove them immediately. Insecticides and fungicides can be used to deter wood borers and other mildew diseases, like cherry leaf spot. Be warned! Not every Newport Flowering Plum Tree is the same! 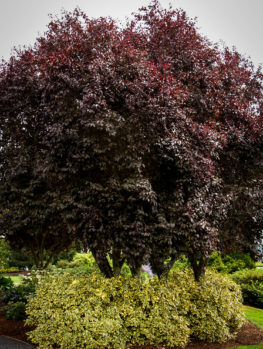 Some nurseries seek to cut costs by replacing the more expensive Newport Plum with a lower-quality variety, cutting costs but leaving you with trees that will not offer the same growth, color, or beauty for which the Newport Flowering Plum Tree is known! Proper investment means using a respected nursery. 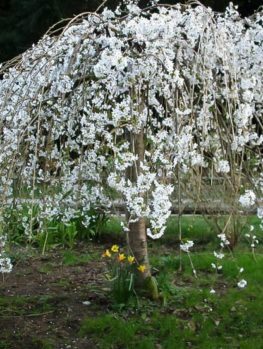 The highly qualified staff at The Tree Center provide the proper care and daily maintenance young saplings require in order to develop into the mature, low-maintenance Newport Flowering Plum Trees for which you are searching. The highest quality trees are just a click away! The best of the breed is available for you at The Tree Center. Our wide range of stocks and supplies is limited and always changing, so be sure to pick out your superb Newport Flowering Plum Tree today while supplies last!